"Although it would have been better to be lightened by a few tracks, this acoustic live show confirms that the Swiss have overcome the loss of their charismatic singer and remain an essential formation." 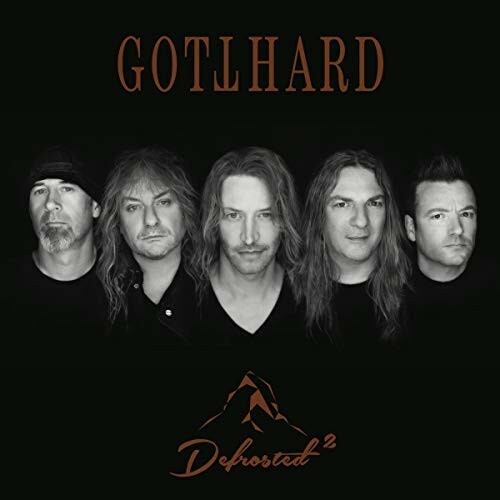 21 years ago, Gotthard released an acoustic live album entitled "D-Frosted", an original format album that showcased the talent of its performers and in particular that of singer Steve Lee. In three studio albums, the Swiss band had established itself in its country and this opus allowed it to move to the next level outside its borders. The rest is history: a succession of record successes, an international reputation and a singer acclaimed by all lovers of the genre. Steve Lee died in October 2010, and it seemed that he could not be replaced. However, Leo Leoni tried his luck by hiring the Australian Nic Maeder to pursue the career of the Swiss melodic hard rock legend. Despite the inevitable comparisons rarely made in favour of newcomers, the quintet has succeeded in putting together three studio albums and tours that have always been as successful. To celebrate the band's 25 years of career and try to impose a little more on its new singer, Gotthard offers a "Defrosted 2 (Live)" which can prove to be both a consecration and a real trap. In order to limit the excess of comparisons between the two singers, Leoni and his band limit the number of common tracks between the two live performances to six. As for the rest of the very extensive tracklist (24 songs spread over two discs), the majority of the tracks are taken from the last three albums in order to put Nic Maeder in the best conditions. However, this one cannot escape the "Hush", "Mountain Mama", "One Life One Soul" and others "Sister Moon", "Lift U Up" and "Anytime Anywhere". It is no coincidence that the public is the most responsive on these occasions, when the Australian gets away with it. Relatively respectful of the original versions for most of them, these legendary pieces are however rearranged for some. "Lift U Up" takes advantage of the beautiful work of the choristers to remain unstoppable in acoustic format, while on the contrary, "Anytime Anywhere" lasts a little too long and loses its effectiveness. In the face of such abundance, it would be prohibitive to dwell on each title. We will therefore limit ourselves to mentioning a few surprises with a "Sweet Little Rock'n' Roller" featuring an extract from AC/DC's "Rock And Roll Ain't Noise Pollution" in the introduction, a bastringue piano reinforcing the light and energetic atmosphere and choirs that are often very present throughout this opus. A string quartet has also been added on several tracks, including the moving "Remember It's Me". In the field of sentimental ballads, Gotthard has long established itself as a specialist in the genre. But although this exercise is often successful, it must be admitted that the excess of sweets is not good for your health and the sequence of several of these delicate pieces ends up handicapping the second part of the album. Too bad because Nic Maeder is still very good at transmitting emotions with talent and accuracy. Is it to compensate for this drowsiness that the Swiss reconnect the guitars on the triplet composed of "Starlight", "Sister Moon" and "Right On"? Difficult to say but although effective and catchy, this approach no longer has much of the acoustics sold for this opus. The album ends with a a cover of 'Smoke On The Water', with countrysing arrangements and featuring choristers an acoustic version of the "Bye Bye Caroline", an undisguised tribute to the "Caroline" of Status Quo composed and performed with Francis Rossi backstage on the Rock Meets Classic Tour. and a new classic ballad named 'What I Wouldn't Give' with a bewitching chorus. It is difficult to be negative in front of such a display of talent and big means to offer a maximum of pleasure to the fans of the band. The objective can be considered as achieved but would probably have benefited from being reduced by a few titles to increase efficiency. Nevertheless, Gotthard confirmed his status as a cult band and thus proved that he had succeeded in overcoming the loss of his charismatic singer, imposing his replacement as a first-rate frontman.